The US Fish & Wildlife Service lists only the Persian Fallow Deer subspecies as endangered. The IUCN lists the entire species as endangered. 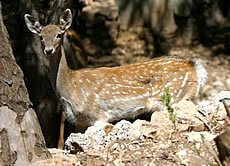 Also called the Mesopotamian fallow deer, the Persian fallow deer is found in the woodlands of Iran and Iraq. It has a reddish-brown, ochre colored coat with many white spots that spread randomly on its torso. There is also a band of white spots along the lower part of its torso and two rows of spots (or in some cases a solid white line) running alongside its darker dorsal line. Its underparts, neck, chin, jowls and muzzle are white. Both male and female have a lump (like an Adam's apple) on their necks and it is more pronounced in the males. Only males have antlers which have thick beams and many tines. The Persian fallow deer enjoys to spend much of the day hidden in dense jungle, and so much time is spent in the bushes that their coats may appear greenish from the constant rubbing against the bushes. Diet consists of grass, nuts, leaves, buds, shoots, and bark. Females are social and groups have been seen with up to 30 members. Males prefer to wonder alone or sometimes in groups of bachelor herds until breeding season. Females give birth to one or two calves after a gestation period of 32 weeks. The Persian fallow deer was once found in North Africa from the Tunisian border to the Red Sea and in Asia from Syria and Jordan to Iraq and western Iran. 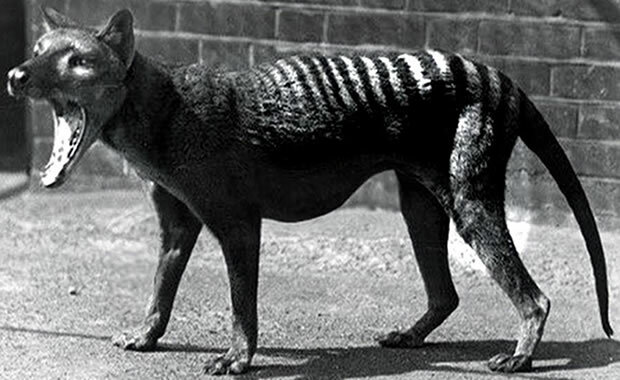 But it was hunted close to extinction throughout much of its range. It is now threatened by habitat loss. Recent conflict in the Middle East has made it difficult to determine the current status of the species. Copyright Notice: This article is licensed under the GNU Free Documentation License. It uses material from the Wikipedia article "Fallow deer". Glenn, C. R. 2006. "Earth's Endangered Creatures - Fallow Deer Facts" (Online). Accessed 4/20/2019 at http://earthsendangered.com/profile.asp?sp=116&ID=8. Need more Fallow Deer facts?